Black pepper can do more than add flavor to your meals. It improves digestion, helps increase nutrient absorption, reduces inflammation and much more. Maybe you already knew these benefits, and that’s why you use black pepper, but have you tried black pepper essential oil? It offers extraordinary benefits, some of which you may not get from the black pepper in your kitchen cabinet. Below are some powerful reasons to use black pepper essential oil regularly. If you read this article, you already know that black pepper is one of the top essential oils for relieving cramps. It has a warming effect that helps relax the muscles. It also has strong anti-inflammatory and antispasmodic properties that relieve muscle spasms and cramps. Mix the oil with a carrier, like jojoba oil, then apply it on the affected area. Have you thought of using essential oils to fight your anxiety? Black pepper essential oil is one of the many essential oils that can help you conquer anxiety. 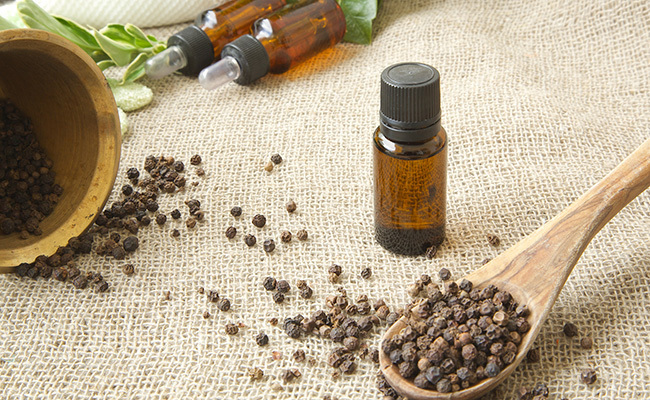 This study found that black pepper essential oil helped reduce anxiety symptoms among smokers. The same study concluded that this oil reduces the devastating withdrawal symptoms of smoking. Is arthritis pain making your life a nightmare? Participants in this study were able to ease neck pain in four weeks by applying a cream that contained peppermint, black pepper and lavender essential oils. You can improve your pain tolerance by rubbing black pepper essential oil (mixed with a carrier oil) on your trouble spots. It helps ease the pain by improving circulation and warming the affected spot. Black pepper essential oil can help lower your blood pressure when ingested. Black pepper contains a compound called piperine. According to research, this compound can lower your blood pressure. You can add one to two drops to veggies, soups, salads and entrees. Black pepper has strong antibacterial properties that can cure bacterial infections in the colon, digestive system, and mouth. You can also use it as a cleaning agent to remove pesticides and bacteria from your produce. Do you struggle with digestive problems, such as diarrhea, indigestion and bloating? Both black pepper and black pepper essential oil can improve your digestion, research shows. Additionally, this animal study found that piperine helps improve brain-gut signaling, which plays a role in irritable bowel syndrome. Even though research is limited on the effects of black pepper essential oil on cholesterol levels in humans, the results in animal studies are very promising. For instance, giving black pepper to rats that were on a high-fat diet helped lower LDL cholesterol and raise HDL cholesterol in this study. You don’t have to miss out on the amazing benefits of black pepper essential oil anymore, as so many people do. Add it to food, apply it topically in a carrier oil or inhale it. I salt and pepper bath with epsom salts and pepper oil is a wonderful painkiller. marjoram suits me fine for arthritis pain and galbanum essential oil and arnica for pain. also using whole peppercorns you get the essential oils if you grind a pepper and eat that. Only use whole peppercorns that you grind the kind that's already ground up is all dried out and nasty. going to try for cramps, ty!